Next post: ‘Not noticing’ may not be the first thing you’d look for in a police chief, but in the Bruce administration it’s an essential skill. 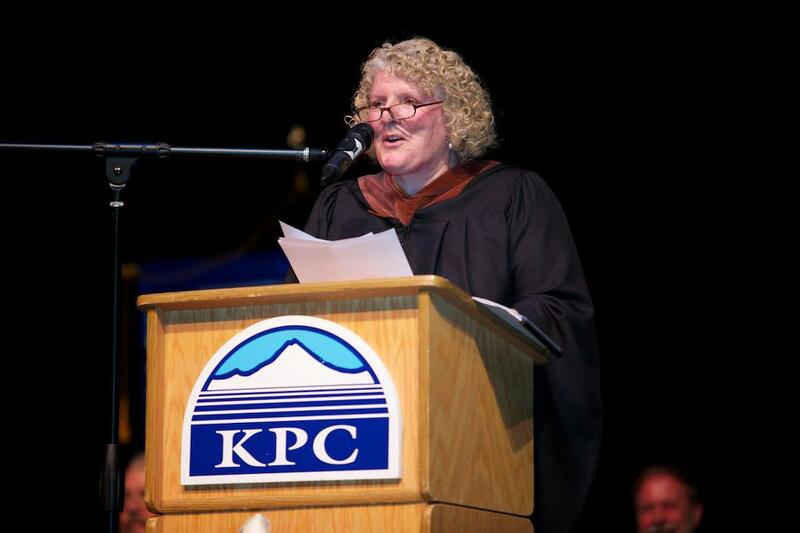 Kenai Peninsula College students invited me to give their commencement address this year. In fear and in trembling, I said yes. My first, my last and my only. I mean it. First time I’ve ever worn MFA robes and cowl. Those sleeves have a life all their own. members of the 2013 graduating class of Kenai Peninsula College. congratulations to Danna Spring, who follows her mother and her brother as valedictorian. Overachievers R Us in that family, evidently. and a big congratulations to the over 100 GED graduates–you’ve made it this far, don’t stop now! Today you prove you finish what you start. You have also earned a degree, which contains the singular virtue of permanence. You can’t lose it, it can’t leave you, it can’t divorce you, it won’t die on you, it’s yours for life. Well done. Some of you may remember a little film from last year called Pitch Perfect. A college freshman joins an a capella group at her university. It’s a story you’ve seen a hundred, a thousand times before: Girl gets boy, girl looses boy, girl gets boy back. But how does she get him back? She risks it all on one song. She not only risks it all, she risks it in front of all her friends, in front of her father, in front of an auditorium full of people, in a situation where she is literally being judged for her performance. It’s a Hollywood movie, he calls her name. But if she hadn’t asked the question, he wouldn’t have had the opportunity to say yes. So here’s the takeaway from this little pop culture lesson. I left a job on the North Slope that paid $64,000 a year to go back to school. That was a lot of money then. It would have been a lot safer to stay right where I was. But I didn’t go safe. I left that lovely salary and all those lovely cradle-to-grave benefits and went back to school and got my MFA in 1985. It took me five more years to write and sell my first book, for the princely sum of $3000. You do the math. It would be another three years before I earned enough to afford my own apartment again. 2. Go big, go bold. The best thing my writing ever earned me was the first thing my writing ever earned me, a residency at Hedgebrook Farm, the writers retreat for women on Whidbey Island in Puget Sound. It was the first time anyone ever acted like writing was a real job. I have some view property in Homer. My newest project is Storyknife Writers Retreat, also known as Hedgebrook North. It will take a million dollars to build and three to five million to endow. Those are big, bold numbers, all right. Failure is most definitely an option. But I’m going to try anyway, because if I don’t try, there is no possibility of success. 3. Don’t be afraid to fail. Neither of us knew what we were doing going in, and the learning curve was very steep. Scott fronted the labor and the costs, to the tune of $2500 a book. For twelve of the longest months of my life I was terrified that the project would fail utterly, and that his business would be tens of thousands of dollars out of pocket and, worse, I would have destroyed the best and longest term business relationship in my life. Nine months after he uploaded the last of those ebooks for sale? I paid off my house, and Scott’s business is now entirely debt-free. Don’t be afraid to fail. Or go ahead, be afraid, but do it anyway. Ask. Them that asks, gets. Understand that you won’t always get a yes in reply. I have coined a phrase, “To be a writer is to embrace rejection as a way of life.” For years I’ve wanted to write an historical novel about Marco Polo’s granddaughter traveling the Silk Road west between the years 1322 and 1327. Every single print publisher I’ve approached to publish it has said, “Mmmmmyeah, no.” None of them want to take a chance on “diluting the Stabenow brand.” I won’t even mention the rabid Kate Shugak fans who only and ever want another Kate Shugak book, world without end, amen. So I’m going to write my historical novel anyway, and Kenai guy Scott Gere and I are going to publish it originally in e, and we’ll just see, won’t we, if I “dilute my brand,” or if I kick the crap out of conventional publishing wisdom. I’m asking my fans to trust me to write something different that they will enjoy just as much as the Kate Shugak series. Again, the possibility of failure looms large and threateningly on my horizon, but, again, if I don’t try? I’ll never know if I could have succeeded. 5. Say yes to everything. Everyone within earshot, most of them Irish, turned around and looked at me, and smiled. I leave you today with the immortal words of Jesse J. And you want to make it dance to your tune. So get off your butts and get out there and make the best life you can. It’s the only one you’ve got, and it never lasts as long as you think it will. Don’t waste a minute of it. Congratulations again, and thank you! And then I went out to the parking lot and tried to run over the chancellor. For your one and only commencement address, that was a helluva address! Didn’t ramble on and on, had some humor, made excellent points – well done! Dana, this was a great speech. Hope you don’t mind but I linked it to my blog post today. I also put in a plug for Kate. Thanks for all the great writing. Sharing. Thank you for this. I wish I were graduating from something so I could bug you about something other than Star! Link/blog/tweet/like away, Becky, and anyone else who wants to. And thanks, everybody. Great speech, it shouldn’t be your last. You should know, this Kate fan is looking forward to reading Silk and Song. Go for it girl. Also, I finished Bad Blood and all I can say is !!!! I will for sure buy the e-book about the silk road. I read everything you write . Dana, this was wonderful! I plan to share it with my kids. Ian is going into 8th grade and Emma into 5th (hard to believe, isn’t it? ), but I don’t want them to get any older before hearing these words. Maybe they’ll listen to you when they tune out on Mom. Thanks! I loved this speech! It applies to life even if you aren’t a graduate. And don’t worry about “Diluting the Stabenow brand”. Many a writer has stepped out of the genre box and written what turned out to be their breakout book. Marion Zimmer Bradley could have worried about “diluting the Darkover brand” when she wrote Mists of Avalon, and what is she most famous for these days? Lois McMaster Bujold departed from her best-selling space operas to write a four-volume fantasy series set in a post-apocalyptic North America – specifically the Ohio River Valley – so real that fans from Wisconsin and thereabouts wrote in to say it made them homesick. Her space opera fans screamed bloody murder at the time they came out, too, I recall. Best commencement speech I’ve heard (read). Also, a good pep talk to get you going in life whenever you feel like you’re in a rut/stuck/in a rat race. you want to write. I like your style. Wait, SILK AND SONG is going to be an ebook? Guess I finally have to give in and get a Kindle! That is the best Commencement speech ever. Usually they put you to sleep. That is an awesome speech! I’m thinking that you are never too old to start saying YES!! I need to remember to do this more often. Saying NO is sometimes way to easy! Love this speech, Dana. I can just hear your voice in it. You make me want to get on a plane to a foreign shore and just say yes to adventure before it’s too late. Can’t wait for either of your next books. Thanks, Alison, and glad to hear Kate helped wow your husband on the pub quiz! Accidently found Kate Shugak when Amazon had a special offer on no.s 14, 15 and 16. Of course I had to then buy no. 17 and then start at the very beginning with no. 1. I am desperately trying to ration them as I have been known to wake in the middle of the night and read the next book – am on no. 5 now. Alaska is a far cry from the north west of England where I live but would love to visit sometime. Until then will have to make do with Kate and a new Sky series all about living in Alaska! Carry on the good work and am looking forward to your Silk Road book. Thank you. Alaska is not that far a cry from northwest England, Susan. I hiked the Coast to Coast in 2005 and felt quite at home in the Lake District. Thanks for writing! Outstanding speech – full of terrific advice. If each graduate only does one of the things your suggest, they will go far and experience much. And I am anxiously awaiting the Silk Road novel. I love Kate and her world, but I trust writers whose work I enjoy to expand their (and my!) horizons. This is simply the best commencement speech I have ever read. So much common sense in a small space. I’m so glad the Kenai grads wore you down! One small question about your writings: where and how did Kate and Mutt meet? (I’ve always wondered and I think I have read all of the Kate stories and books.) Please point me where I need to look. Many thanks. Can’t wait for Silk and Song to come to fruition! Thanks, Shirley. Kate and Mutt’s meeting evolved over time, to the aunties giving Mutt to Kate as a puppy when Kate came back to the Park. The Star series seemed to end with the readers left hanging. Are you planning on more letting us know about Elisabeth? What the sinificance of the discovety on Mars means to Earth? What happens to teh twins? etc. Thanks for asking, Rick. My favorite book (of mine) for a long time was Red Planet Run. I always meant to get back to that series but I have yet to carve out the time. Great speech, and one I’m sure they’ll remember. Thinking back, I can’t even tell you who spoke at my University commencement, or what they spoke about…. Nicely said, Dana, and you look great in the picture! Agreed on Ireland – the people there were wonderful. About Silk Road, I love it to pieces. It’s a different storytelling style from the Kate books. More… oral, I guess? It feels like sitting out there around a campfire with you spinning a tale. It will make a great audio! Great address, Dana, and great advice you’ve given these young people. And would be good comments for an advice column to older persons too.. Inspiration, for sure! Your speech is extraordinarily inspirational. I will print and post it on my wall next to the Jack London quote of 5/9/14. Re Kate, et alia: I, too, am anxiously waiting for the next installment. When I find an author, who writes wonderful books, I read many, if not all of her books. I found your name under Diana Gabaldon’s methadone list. I also enjoy your book recommendations that you put in your books. If you need a topic for a short story, please consider writing about Bobby and Dinah’s wedding. I will take your suggestion under advisement, Marjorie, and thanks! Wonderful speech. And kudos for going Indie with the Silk Road novel. I can hardly wait for that one. They are wonderful writers- Dana Stabenow! Why am I in 2017 just now reading this? What a helllava commencement address! I say YES! Thank you, Marty. I was really happy with it. Glad you liked it, too. Yes I trust you — I trust your writing. I’ve read your Kate books, Liam books, the CG books, all good, and I expect to continue to enjoy your books though now for the most part my ears have replaced my eyes (which complicates reading in bed – the book doesn’t know I have gone to sleep). Is there or will there be an audio Silk and Song? That is the best commencement speech I have ever read or heard. Excellent advice. I am so glad the ebook project worked out. I am in the middle of our Kate food project. Holding my Kindle in my lap and scrolling down the page makes it so easy to to back and check the notes I took listening to the Kate books. I love Silk and Song. My imagination and the pics of your trip made the book even more amazing. I hope you do more motivating speeches like that. I am glad Storyknife is working out. Works to live by! Bravo I am a sixty eight year young woman with out a college education. I worked my way through a retail company in many years by saying “yes to the jobs were way above my abilities . asking questions and shear determination always paid off. Now retired I am always looking for new challenges that are out there. Recently I was asked back to my previous job to supervise a group of young people in doing a complete store remodel. I only knew what it was supposed to end up looking like!The steps between A-Z were many and took four months. I learyas much as those young people. Earned their respect and friendship along with my own huge sense of accomplishment.Nevetoo young or old to reach for what you want. Maybe not even knowing you want it at the time. Dana , love your books and your outlook on life!! I wish I had had you speak at my college graduation! (Albeit, it was in 1971 & you probably weren’t even born yet!) I wonder how many of those graduates realize how lucky they were! I LOVE THIS SPEECH . . ..It’s the sentiment, well, several sentiments, I’ve tried to pass on to my students and my own children over the years. Take a chance . . .or you will never know!! You preach it, sista!!! I’m not one of those who think you can only write Kate Shugak. I love all your novels, your style. Have you moved on from Kate? Please tell me you haven’t. I really miss Kate and Mutt and their Alaska. And all the others. Did you get burned out? If so is there anything we fans can do to whip up your Shugak juices? Thank you for all the compliments! As it happens, I’m working on the 22nd Kate Shugak novel. It’s called No Fixed Line and it will publish at this time next year.